“Drowning in sound” is a main kind of feeling while playing the Guzheng. The deep and powerful bass, the charming sound of the plucked high strings and the endurance of the chords are hypnotizing the player as well as the listener. 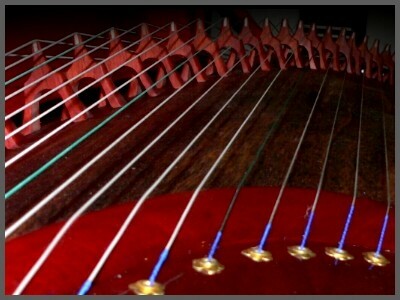 Compared to other zithers of Asia, the Guzheng overwhelmes most of all with its powerfull sound. The big size of the instrument (about 1.60 meter long) does not only give a good resonance, it also amplifies each touch, scratch or unwanted slide on the strings and keeps every sound under a long sustain. There are many ways to tune the Guzheng, but I never managed to change the position of the pyramids while playing a piece - they are holding the chord and are to much fixed to be moved within a second. This is why the pyramids are just moved for fine tuning purpose before playing, the main tuning is made with a tuning key. This is the best and most common tuning for all improvisations. Like playing the PiPa, most Chinese players use 3 plectron as elongated fingernails for playing, which are made of plastic today and are fixed to the fingertip with some tape. But even without the plecs, the pure finger might already be enough to discover the many sounds of the Guzheng. In the pentatonic scale each tone can be the basic tone for bidirectional scales. This is why it can be important to play an ostinato of one single tone or just simply select one tone to be the “base” to which your melodies always come back. Pluck the strings with your right thumb, index and middle finger. The left hand can press down the plucked string on the other side of the pyramid thus changing the pitch or creating a vibrato. It can also try to find the Flagolet tone for the plucked chord. the multiple and powerful sounds of the Guzheng will keep the player satisfied for hours! 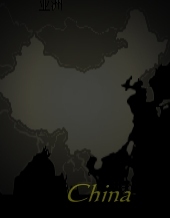 Please check the Links and Musicians for scores, tips and partitures for Guzheng players!